It is both fortunate and tragic that we can package an innovative filmmaker’s life work into a 7-disc box set. The tragedy is that he was not able to share more of his artistic vision, either due to financial or creative issues. You would be hard pressed to find another auteur who matches the quality of the heart of his output from 1953 until 1967 with Monsieur Hulot’s Holiday, Mon Oncle, and PlayTime. The last film of the trilogy, which is arguably the best, essentially ended his creative freedom and harnessed his talents. His career ended with a whimper, and his final projects never made their way out of development. On the other hand, despite the lack of production, it is quite a journey to wade through all of the creative works from someone of Tati’s caliber. The Jacques Demy box set that came out earlier this year similarly captured the essence of his career, but not the entire narrative. There were notable omissions, some of which would be a good fit for Criterion (Model Shop), while others wouldn’t (Parking). 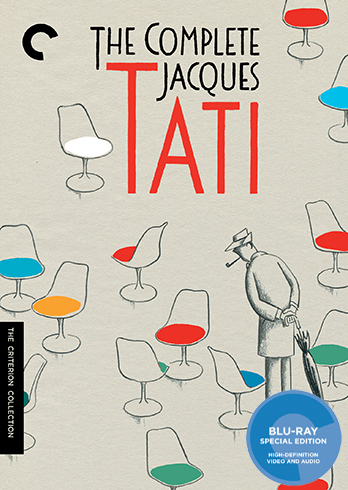 For Tati, even the lesser films are Criterion-worthy, as they highlight his talents and his style in various ways. He had financial problems after PlayTime, but that did not force him to compromise his artistic integrity in order to make a fast buck. Tati began his career as a music hall performer and a mime, and in many ways, he remained as such throughout his career. The oddball characters of of François the Mailman or the popular Monsieur Hulot showcased his physical talents and comic ability. Since his characters were mostly mute, he was a mime without the makeup, a music hall performer without the music (at least not the same type of music). And he could always make us laugh. People fascinated Tati. He used his films as a way of observing the habits of ordinary people, however odd and nonsensical, and how they transformed during the period of economic prosperity and American innovation following the war. He was always an observer, and his film style made us observers as well, rewarding us for our attention to details, with hidden gags buried layers below the surface or in the background of the frame. He challenged us to be curious like him. Tati denied that he was critical of modern architecture. He constantly claimed to be impressed by it, but not always by the people who inhabited it. A large part of his work satires the preposterous lengths that people go in order to improve their lives, whereas deep down they are merely trying to impress others. Hulot as a character and Tati as a person were less than impressed by these displays. To them, having the latest gadget, or the most immaculately manicured landscaping, or an appliance that has an inexplicable additional feature were pointless. He wanted to get to the core of humanity, get people away from the hustle and bustle of the city. This sometimes meant meandering around a small town where garbage lies in the middle of the street, or transforming a ludicrously designed restaurant into a relaxing bistro where companionship and revelry were most important. These little treasures from the old France were being lost, little by little, but there was beauty still to be found among all the chaos. Few scenes illustrate this point better than PlayTime when Barbara opens Hulot’s gift en route to Orly airport, to uncover a lovely flower arrangement, which not-so-coincidentally resembles the streetlights that guide their way back home. The box set is a delight, and ranks at the top of the Criterion sets that I’ve explored to this date. Posted on December 19, 2014, in Criterions, Film and tagged criterion, film, jacques tati, Jour de Fete, mon oncle, monsieur hulots holiday, parade, PlayTime, tati shorts, trafic. Bookmark the permalink. 1 Comment.